"Mobile multiplayer isn't stagnating. It's evolving behind the scenes." Grab your phone, head to the app store and take a quick look down the Top Grossing Games chart. In addition to Pokémon Go and the usual single-player casual hits like Candy Crush, you'll notice something of a trend: a slew of multiplayer strategy games. Unyielding in their chart dominance, Clash of Clans, Game of War, Mobile Strike, Clash of Kings and any number of other apps all revolve around the same concept: build a kingdom, join a clan, crush your enemies. And potential customers taking a cursory glance at the description and screenshots are unlikely to see much difference between them beyond art style and setting. Last year, ex-CCP devs Solid Clouds said mobile strategy games haven't changed in ten years, and looking at these charts it's hard to argue. Are mobile developers seeking a top grossing hit forced to build a game based on an increasingly stagnating multiplayer market? 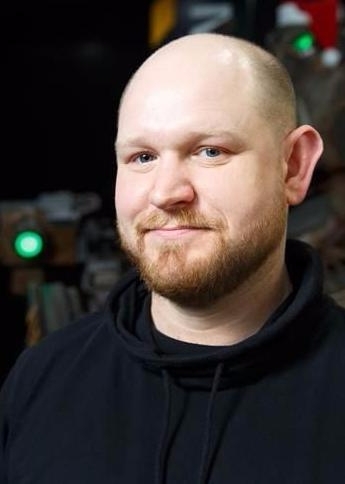 "I think 'stagnating' is a strong word," Plarium creative director Nick Day tells GamesIndustry.biz. "Pokémon Go, for example, successfully brought a new mainstream multiplayer experience to players in 2016, and Clash Royale has really set a benchmark in the move towards live, synchronous gameplay in the west." Day's experience mostly stems from the sector Plarium focuses on: mobile MMO action strategy games that target a core audience and compete with the aforementioned chart-toppers. Indeed, the firm's own Vikings: War of Clans can also be found in the Top Grossing rankings. Defending his sector of the mobile market, Day stresses that there is innovation happening with mutliplayer games but it's "mostly under the hood", revolving more around refinements and mobile adaptations of ideas from other platforms than completely new mechanics. "It's tough to differentiate your game from others. There are only so many ways you can say 'PVP, Clan Warfare, Play Online with Players Worldwide' and so on"
"There's still a lot of change going on, but there are good reasons for it not looking radical," he explains. "Developers are building upon more than 20 years of great multiplayer games with tried and tested mechanics supported by industry data on which loops work and which ones don't. We haven't exhausted that backlog of mechanics on this medium yet. "This doesn't mean that there isn't innovation - you can't just copy-paste from other games. It just means that much of the creativity is happening in the space where devs deconstruct and adapt these mechanics to mobile in a way that's stable, monetiseable and fun." He goes on to suggest that while app stores may appear to be flooded with Clash of Clans clones, each title will have its own differences and unique selling points. The difficulty is marketing those without damaging your discoverability - particularly if you're aiming for a similar audience. "There's a lot more segmentation than might be obvious at first glance," Day says. "These games are still distinct experiences. However, that's tough to show when trying to differentiate your game from others. There are only so many ways you can say 'PVP, Clan Warfare, Play Online with Players Worldwide' and so on." "Let's say you do make a revolutionary mobile multiplayer game with mind-blowing new player mechanics - how do you surface that message effectively to players whilst still presenting enough recognisable features to get traction with your known core demographic?" The platform holders have a role to play here, says Day. Both Apple and Google are in the position to boost games that are trying to do something truly different by promoting them via the highly-coveted 'Featured' spots - something he urges both companies to continue. "Multiplayer free-to-play games shouldn't punish players for not being on their phone at a certain time and place, but instead focus on rewarding them when they are"
"Rewarding games that employ unique player-facing mechanics with a 'featuring' spot on launch or after an update can incentivise innovation and help offset some of the inherent risk in the decision-making process," he says. "If game designers want to devote time to an amazing new multiplayer feature, but one that may not work, will require four months of new server-side development and takes time away from monetisation updates and bug-fixing, saying 'yes' to that takes a lot of faith. "Balancing that risk with the knowledge that innovative multiplayer mechanics might convince your partners to expose the game to millions of new players and save a third of the game's marketing budget is a lot more enticing to a developer." Day recognises there are still "very real limitations" devs face with both the mobile devices currently on the market and the data infrastructure. Part of the reason so many multiplayer strategy games are similar is because this is the level of battles and large-scale warfare that devs can deliver without affecting performance. "If a developer is trying to create a true real-time synchronous strategy with hundreds of units and multiple players, they're going to have deal with the issue of lag and varying device capability and compatibility," Day observes. "But developers are getting smarter about working around these limitations. We're starting to see very robust networks that handle vast amounts of multiplayer data in very efficient ways that allow us to get us closer to PC or console experiences with current-gen devices." Regardless of the improvements to networks and mobile performance, the key to success for any multiplayer game is, y'know, multiple players. With the leading games establishing a firm grip on such vast audiences, developers need to work even harder to build their own communities. Laying the groundwork by implementing compelling social and competitive features is vital, but Day stresses you can't take it for granted that people will play together - or even know how to. "There's the assumption that all new players will know what clans are, will get why they're fun, and will be able to figure out the mechanics. In many games, it's barely covered in tutorials"
"That's one of my biggest pet-peeves," he says. "Players who regularly play with multiplayer don't need much encouragement if it's rewarding, if they have a place to communicate, and if they have the tools to play. But I see so many games with killer multiplayer gameplay that just do a terrible job of simply telling players it exists. "There's the assumption that all new players will know what clans are, will get why they're fun, and will be able to figure out the mechanics. In many games, it's barely covered in tutorials and onboarding. Looking back at some of our earlier games, I saw that despite the high retention numbers and engagement for players in clans, we basically only told players about it for approximately two seconds." Plarium has improved on this. 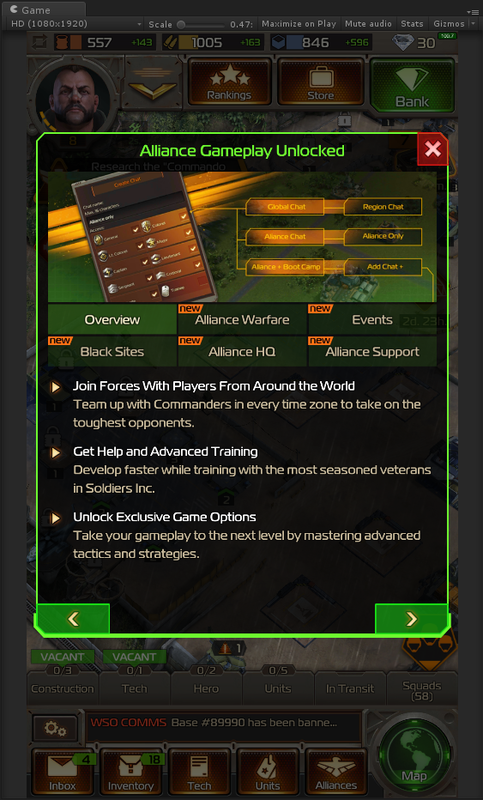 It's latest release, Soldiers Inc: Mobile Warfare, takes more steps to introduce its multiplayer to users with walkthrough of its more complex features and, more importantly, a big pop-up that offers a summary of why players should engage with it. "We saw that simple, easy to implement steps like these make it easier for players to learn the game when compared to our most similar mobile release, Stormfall: Rise of Balur," says Day. "If developers want to encourage engagement, don't be coy about its importance. If multiplayer is the core of your game, let players know. "Also, bear in mind the majority of player communities aren't binge-playing for ten hours straight with 100% attention, as they might in WoW or League of Legends. This is why we favour report-based game battles. Multiplayer free-to-play games shouldn't punish players for not being on their phone at a certain time and place, but instead focus on rewarding them when they are." While the top grossing charts have barely changed over the past year or two, the introduction of larger, more ambitious games to the market should nonetheless drive growth for the whole mobile industry. Leading players such as King and Zynga have strived to enter the mid-core space - very recently, in the latter's case, with the launch of Dawn of Titans - and traditionally core genres and mechanics such as MOBAs are rapidly finding their way onto smart devices. This, says Day, is very encouraging. "I really hope Vainglory and other core games coming to the mobile space continue to develop and do well and drive innovation," he says. "I keep banging the eSports drum with this as well: the channels are now there that can truly take core multiplayer games mainstream. "The space will continue to grow, and I think we'll see many of the current limitations ease as technology catches up. More powerful devices with faster, more reliable connections and fewer data restrictions have the potential to really expand the landscape - there's a long runway here." His final advice to developers hoping to break through the appearance of a stagnating market is not to reinvent the wheel but to build ones that role smoothly. "Look for ways to make the simple, existing features frictionless for your players," Day says. "If you innovate, and it's working - don't be afraid to embrace those features and push them further towards the core of your game experiences. When we first added clans to our games, they were a novel little metagame. Now they drive the experience. So don't be afraid to rip out older, disparate features or condense them to increase player focus on what works best. "Is [the number of similar games competing] bad for the industry as a whole? I don't think so. I think it's a side-effect of the market maturing. The North American Video Game Crash happened in 1983 - the year I was born - and yet here we are now with interactive media grossing higher revenue than films."